Not all cosmetic companies are created in the same way, and the Chamonix Skin Care Company is refreshing change. Formulated by a pharmacist for a friend, a product was created that helped reduce wrinkles and the signs of aging. In a short time requests for this formula required George Faltaous to quit his job and focus all his attentions on this emerging breakthrough product. When asked to develop an anti wrinkle cream that would work, George Faltaous used his knowledge of chemistry, nutrition and pharmaceuticals to create the first in what would become a large line of skin care products. The Chamonix skin care line grew from one compound that included antioxidants, absorbable collagen molecules and the herb Calendula that has been used for centuries for restoring skin health. Once the formula had been created its value was quickly discovered by others who noticed the amazing results. Requests for Chamonix increased as did requests from physicians, radio talk show hosts and other medical and skin revitalizing facilities. Faltaous insisted on using antioxidants as primary ingredients in Chamonix products due to their affect on skin tissues exposed to air borne pollutants and the natural processes of the body. 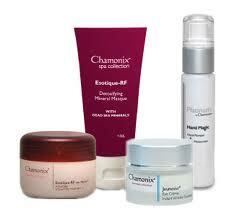 All Chamonix skin care products include antioxidants, and no animal testing is every done. At some point, everyone will develop wrinkles but the amount and depth of them can be controlled and reduced by using anti wrinkle products. Chomonix skin care offers several different wrinkle formulas. Esotique-RF w/ Renovage is designed for mature skin helping rebuild and restore skin that has lost elasticity and fullness due to the loss of hormones due to menopause and aging. 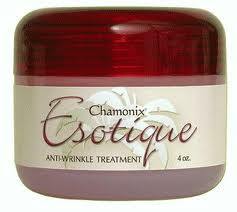 Esotique-RF with Matrixyl™ is Chomonix's most popular anti wrinkle treatment containing both protein polypentapeptide that helps restore collagen and hyaluronic acid that helps the skin retain moisture. Jeunesse eye cream designed to be worn under make up, will significantly reduce wrinkles. Skin around the lips is especially difficult to treat, because it is exposed to all agents that affect and cause damage to the skin. Chamonix skin care developers understood how difficult this area was to treat, and created the Jeunesse Lip Lines Treatment with Jojoba and GABA, an amino acid from plants that acts as a calming agent for irritated skin. Chamonix reports that this particular lip treatment is affective even for chronic and deeply wrinkled skin, including cigarette smoker's lips. The makers of the Chamonix skin care line consider all of the body's skin important, and have additional products for those areas. Provia Scalp Treatment contains 2% Procapil that blocks DHT a natural substance produced by the body and is responsible hair loss and thinning. This product has been proven as affective as Monoxdil without the harmful side affects. Th-121 - Understanding that nutritional health and healthy bodies effect how the skin can repair itself, Chamonix has a weight loss formula called Th-121 that naturally increases energy while providing vitamins and antioxidants like green tea, blueberry, acai berry, pomegranate and additional Vitamin C for both nutrition and skin repair. The Chamonix skin care company realizes that purchasing many products from various sources can be time consuming and frustrating. The company has packaged many of their products together in sets allowing customers to choose one of four specific groups of formulas. The Classic Package formulated for mature skin includes a two-month supply of Esotique-RF, which can be substituted for Esotique, Deep Firming Serum, and L'essence. Their Lip Lines package includes Jeunesse Lip Lines Treatment, Lip Plumper and Lip Balm. 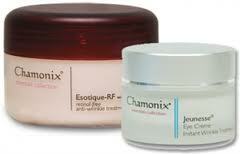 Chamonix's Miracle Package contains one ounce of Jeunesse Eye Crème and two ounce jars of Jeunesse Face Serum and Esotique-RF. Customers who want to include weight loss with wrinkle reduction may want to consider Chamonix's Weight Loss Package that includes three sixty capsule bottles of Th-121 and one bottle of Th-121 15 Day Cleanse. Chamonix products are quality tested and endorsed by many physicians and clinicians. Choosing one or more of the many Chamonix skin care products will have your skin looking younger and smoother by providing safe, natural ingredients as part of your overall skin care regime.